OK, could we keep Captain America in his own reality, for heaven’s sake? 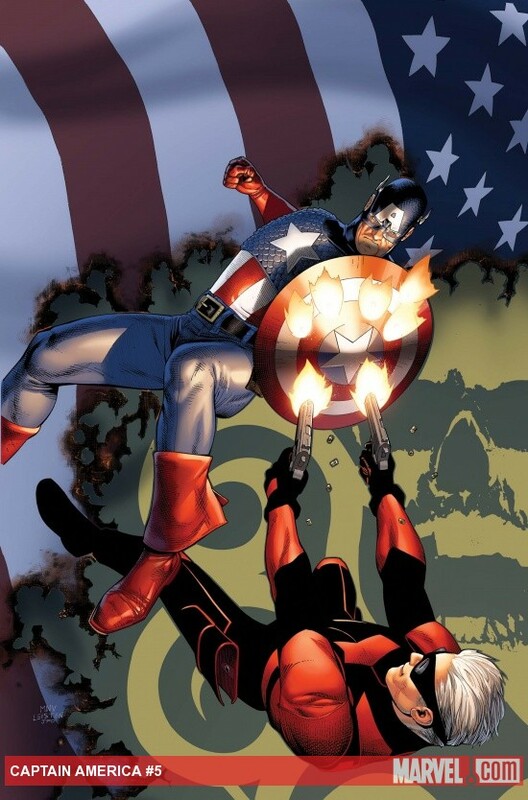 Over the last five years, he has been dead at least twice, forced to live through his entire life again while world thought him gone, and drafted to lead SHIELD and the Secret Avengers when all along his true destiny was and is as Captain America. Sheesh. Get him out of Dreamworld. You know, it is great to see Hydra again. It is nice to see a female head of Hydra. Good to see Fury and Carter and Falc again. However, could we write our own stories and quit ripping off the 60s and 70s and 80s Cap runs? I almost expected to find Bucky/Cap tied to a chimneytop when Steve came back to be Cap. It is so lame. It isn’t homage, it is parody how crappy it is. Ed Brubaker, you are a creative guy. I’ve looked over Fatale and Criminal. That’s good stuff. Quit phoning it in on Cap, or give it to someone who can do something. What’s next, Cap puts on the Nomad Uniform again? Garbage! Captain America deserves better than poorly done recycled story lines from the 70s. Ameridroid? Cap giving up on America? Depowered? How many times has that been done just in the last 15 years? If he has to come up with Nomad armor, I may just give up entirely….